This article was published in the Winter 2012 issue of SSA Magazine. 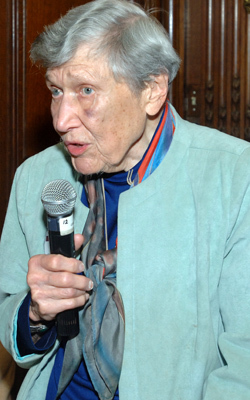 Ruth Irelan Knee, A.M. ‘45 died on October 8, 2008 at the age of 88. A pioneer in social work and community mental health in the United States, she was awarded the Edith Abbott Alumni Award in 2001, established the Ruth Knee Faculty Support Fund for Spirituality and Social Work, and served as one of SSA’s luminary volunteers, sponsoring Washington Week, the student career services program designed to help SSA students learn about career options in social policy and government. Knee served in the U.S. Public Health Service during the 1940s and in the then-new National Institute of Mental Health, where she was a liaison for policy development and technical assistance concerning the mental health components of Medicare and Medicaid. During her 30 years of federal service, Knee developed social work roles within public health and military health care programs and advanced innovations and improvements in mental health services. Knee was a leader in several professional organizations, including the National Association of Social Workers, the Council on Social Work Education, the American Public Health Association, and the American Orthopsychiatric Association. From 1963 to 1970 she was chairman of the NASW Committee on the Study of Competence, which was instrumental in setting standards for social work practice.